My wife had been wanting to go to Portugal for quite a while and eventually persuaded me, with the help of some very good fares from LGW to Porto, to go for a few days’ sightseeing (neither of us has the slightest desire to lie on beaches or play golf!). Thus far, I have only visited two countries without travelling on any railed transport (Canada, and a half hour visit to Mexico, if you’re interested) and I saw no reason to add to this list. Although travelling by car I did manage to divert to the metre gauge! Not strictly a gricing trip but with some worthwhile objectives! Courtesy of our daughter, arrival at Gatwick in good time for a BA A320 to Porto. Scheduled to go at 1340 it did just that, then spent over 30 minutes queuing to take off. Despite this, arrival at the very modern (and being extended) OPO was only 10 late at 1605. 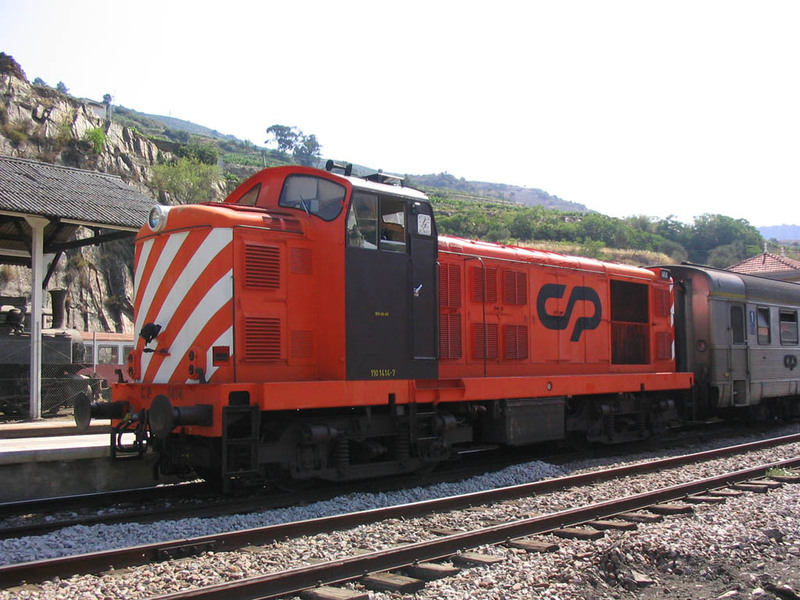 Objective 1 was the Rio Tâmega line from Livraçao to Amarante. Car hire is remote and we had to wait for a minibus from Budget to collect us. All credit to http://www.carjet.co.uk/ though, who provided a good deal on a gutless but air conditioned VW Golf. Off through the horrific Porto rush hour, bewildering motorway toll system and appalling signposting (or lack thereof). 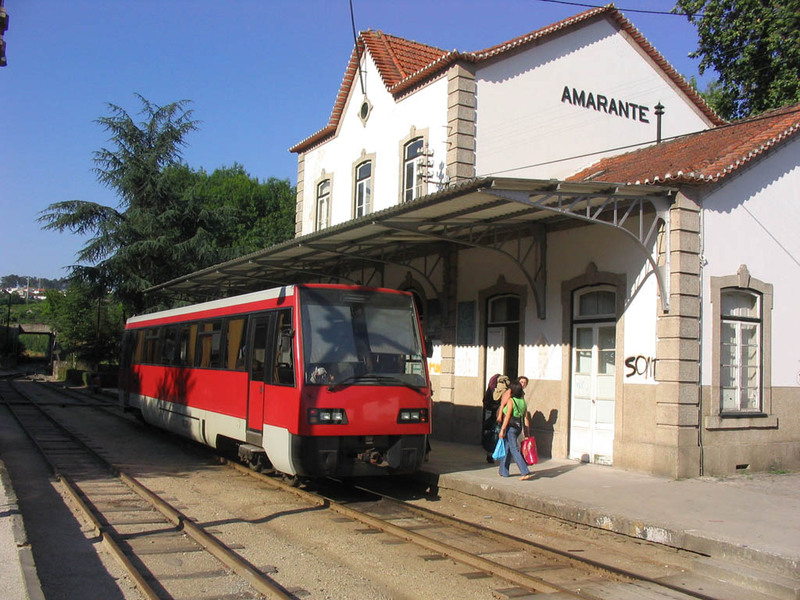 Despite all of this we found Livraçao station by sheer luck and with about 5 minutes to spare for the 1802 to Amarante, a single unit of the 1995 dated genus LRV2000. Aircon not really up to the job [wasn’t expecting any, so it was still a bonus] but a splendid ride nonetheless up the much dammed (as is the Douro) Tâmega to Amarante. 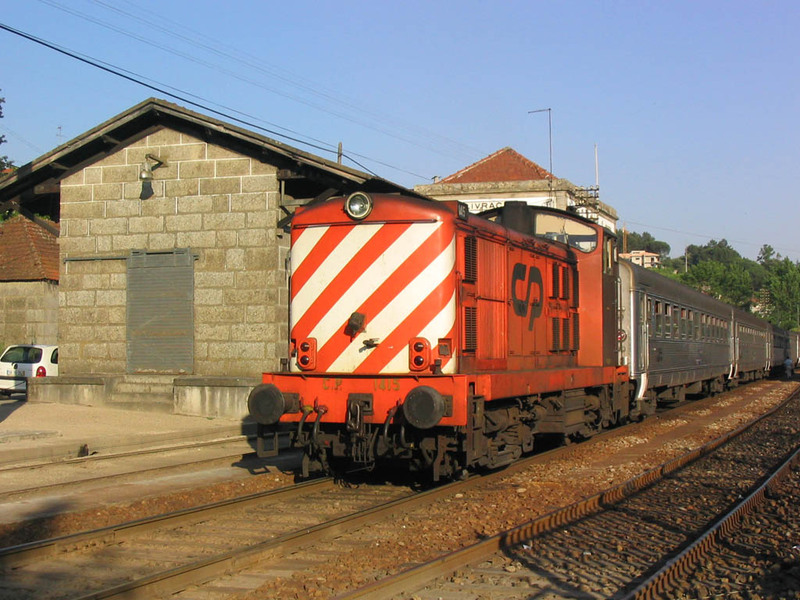 Despite being too far from Porto for commuting, patronage was reasonable with some alighting at intermediate stops. The 4 minute turn round at Amarante just allowed time for a phot, but little else. No track today after last night’s horrendous drive from Livraçao to Viseu. On after a look round Viseu to the astonishing fortified border town of Elvas with its 15th century ‘multi-storey’ aqueduct, and then to the former Roman settlement of Évora. A morning visiting a nearby stone circle at Guadelupe (actually 4 km down a dirt road) then back for an afternoon’s sightseeing (‘mediaeval’ single storey aqueduct, university church, Roman temple, cathedral, Chapel of Bones – a grotesque ossuary) in Évora. Finally dinner and a visit to the St John’s Fair opposite the Ibis, clearly (one of) the event(s) of the year. 0730 departure for the long motorway thrash to Porto, and another afternoon sightseeing (riverside, bridges, the house of Henry The Navigator, and a glass of port on the quayside at Gaia). 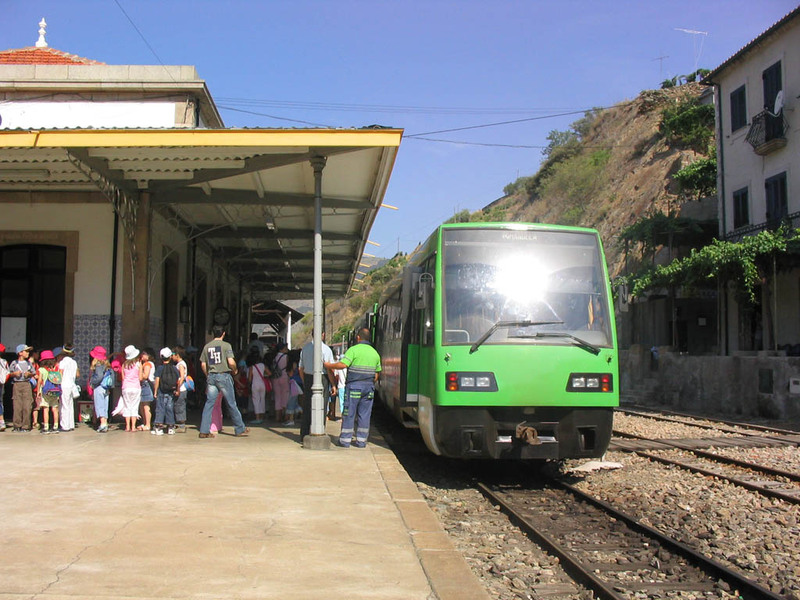 Track content too, with the scary Funicular dos Guindais, reopened in 2004. This is fully modernised and consists (from the top) of a short run through tunnel followed by a terrifying drop down to the Don Luis bridge. Good value. With most things shut on a Saturday night, dinner in a grotty shopping centre grill. 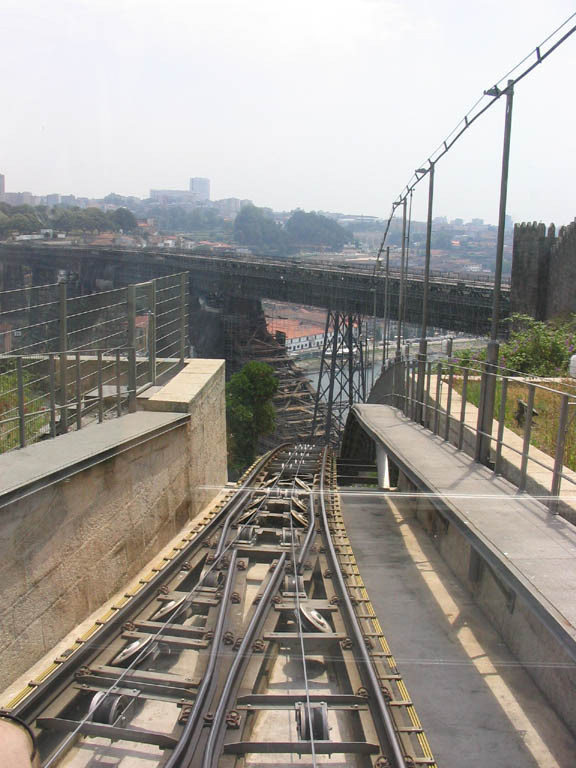 The passing loop and start of the incline on the Funicular dos Guindais in Porto, 19.6.05. The Dom Luis 1 bridge is in the background with the top deck under reconstruction. Our one serious gricing day today, with an 0500 start for the 0530 departure to Mirandela. Delayed by my stupidity in leaving the directions behind we eventually got away at 0550 for the 0826 departure. After a few excitements we reached the motorway caff 10 km from Mirandela at 0745 and all looked rosy. After filling up, queuing to pay, queuing again to pre-pay for breakfast (Italian procedure – stupid), having our ham sarnies made to order instead of ex stock from the display, and consuming same, things ween’t so rosy. Arriving in Mirandela around 0815 we managed to drive straight to the station, not see a level crossing as we went over it, and not see the station 100m to the left. So we turned right and went to ask a completely (and entirely reasonably) bemused lady in a shop where the station was! We made the train though, and ‘enjoyed’ a 90 minute trip to Tua in one of two LRV2000’s occupied by around 100 primary school children. At Tua, after photting a stuffed Mallet with a distinctly British look about it, and two resident cats (really, one ginger, one black) we retired to the pub over the road, as you do. Beer was the usual brown fizz (but hey, who’s complaining? It was hot and the beer wasn’t) and coffee was not to be had because of a power cut. A certain irony there, with the Douro valley being a hydroelectric stronghold. Two 1400s came and went before our 1055 departure. Alas the primary school party returned with us and after an hour of the journey back to Mirandela were understandably getting a bit bored and fractious. Nonetheless it’s a fine line though more interesting in the lower part where the Tua and the railway occupy a narrow and very rocky gorge, with surprisingly little serious engineering. There are a small number of tunnels near Tua, to the delight of the kids. Back at the apparently invisible (!) we dived into a horribly, albeit temporarily, hot car for a sprint to Vila Real via the local farmacia which perhaps surprisingly, sold H’s hay fever remedy. At V.R. we ‘lucked in’ again, finding the station easily with time for a beer and another sarnie in an obliging caff across the road. The Man was very proud that a Portuguese driver (Tiago Monteiro, Jordan) got a podium place at the US GP – he didn’t mention that McLaren, Williams, BAR, Minardi, Toyota, Red Bull and Renault weren’t there! [All the Michelin shod teams were withdrawn due to a safety scare following Ralf Schumacher’s accident]. 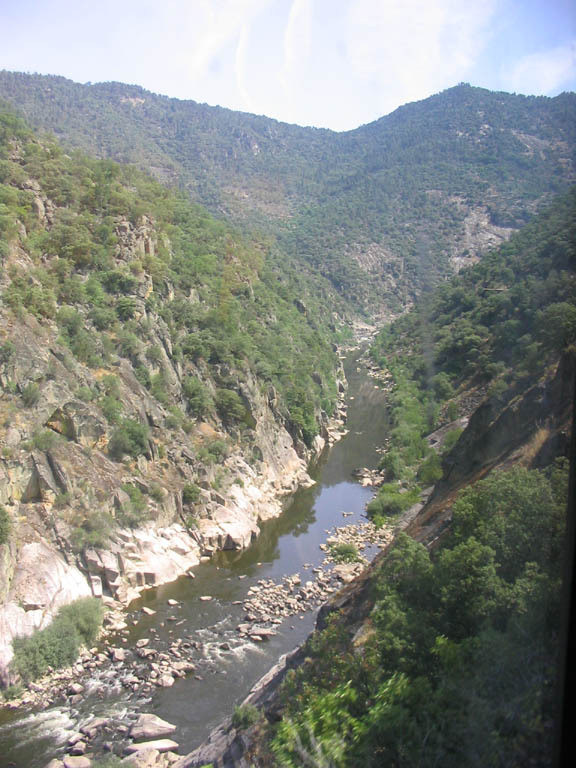 The Corgo valley line from Vila Real to Peso do Régua proved to be the most spectacular. For the majority of the journey it’s perched about half way up the side of a deep valley – deeper though wider than that of the Tua. Cost was obviously a factor in the engineering and the line deviates several times into minor side valleys with a ‘U’ turn to get back, rather than a viaduct at the end of the valley. Thoroughly enjoyable! 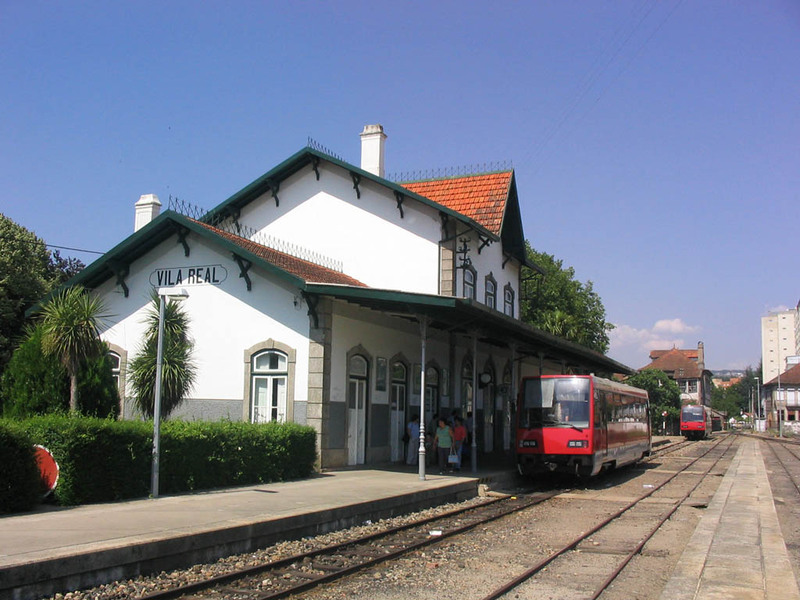 Corgo station, and Régua depot, are located where the Corgo meets the Douro. 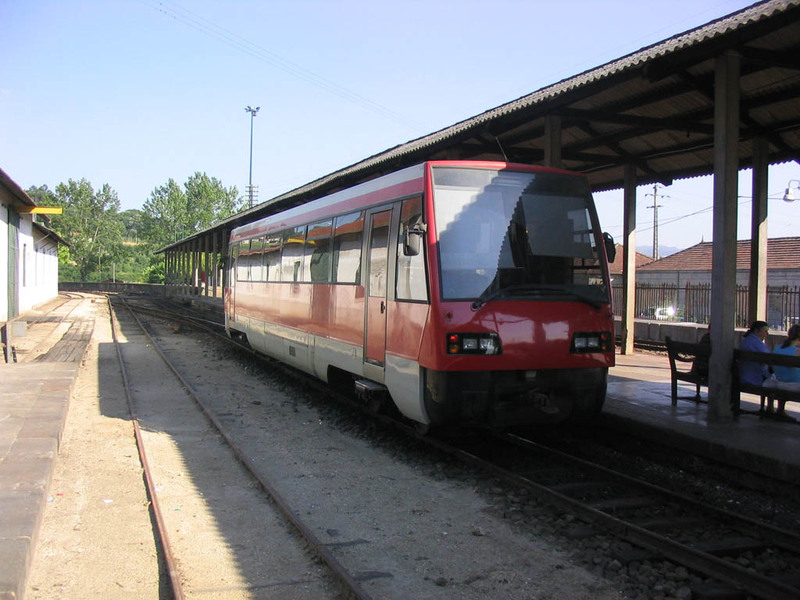 Corgo station is on the narrow gauge immediately before the depot which is between the narrow and broad gauge lines. The two lines run together across a viaduct over the Rio Corgo, with narrow gauge rails between the broad gauge ones (4 rails rather than 3). Entering Régua station the broad gauge passenger lines go right (north) but sidings go left, with the metre gauge terminating in bays between the two. Régua has a relatively posh buffet from which beer was obtained in the 18 minute turnround. This completed the gricing part of the trip and we had a reasonably gentle drive back from Vila Real before getting lost in Porto. Again. Evening food and drink was at the Republica do Cerveja which, frankly, I wouldn’t be bothered with. The ‘Artisan’ beer was indistinguishable from any other fizzy lager except by its price. Not a gricing day regrettably – but a bit of sightseeing in Porto before going up to Vila do Conde. Much cracked up by the Rough Guide but (surprisingly for them) it was a bit of a disappointment. We made the best of it however, before heading back to the airport and returning a hire car which was, totally against the odds, entirely undamaged. 1400km had been covered by road. The flight back to LGW (scheduled departure 1640) pushed back at 1630 and was airborne at 1642. At the time of writing we’re approaching LGW with a 15 minute early arrival on the cards. (Later) It wasn’t quite that early but was exactly right for meeting our son-in-law in the pick up/set down area, whence back to their home.